Seeing a snake in the wild is unusual, spotting a wild snake that has just caught its prey and is in the process of feeding is rare. While fishing on a stream in the Eastern Sierra mountains, we happened on a gopher snake that had just constricted a pack rat and was starting to swallow it. You can see the bottom edge of the pack rat's stick nest in the top right of the photo. When a snake is swallowing its food, it is vulnerable to predators. It was evening and this gopher snake was not happy when it initially realized it was being observed. 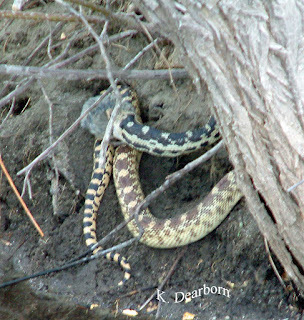 But we kept our distance and just watched and the large gopher snake settled into consuming its catch. The snake was approximately 1.75 inches in diameter, while the rodent was about the size of my fist. It took 5-10 minutes for the six-foot snake to swallow it's large meal. Once the large rodent was swallowed, several of the observers were surprised that there wasn't an equally large lump in the snake's body. But a snake body is very muscular and unless a meal is supersized, the food is compressed down and sent on its way to the very efficient digestive system. Most likely, this snake will not need to feed again for at least 3-4 weeks. 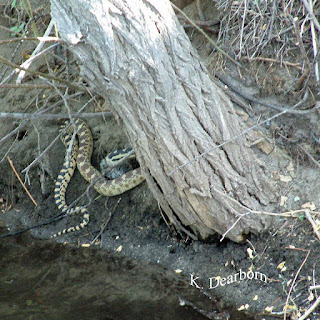 Amazingly, within 20 feet of this sizable adult gopher snake, we also saw a new hatchling (about the width of cotton yarn) swimming up the stream and a yearling (about the width of a pen and 2 ft long). Obviously this stream-side ecosystem was providing enough varied-size prey for multiple generations of gopher snake. 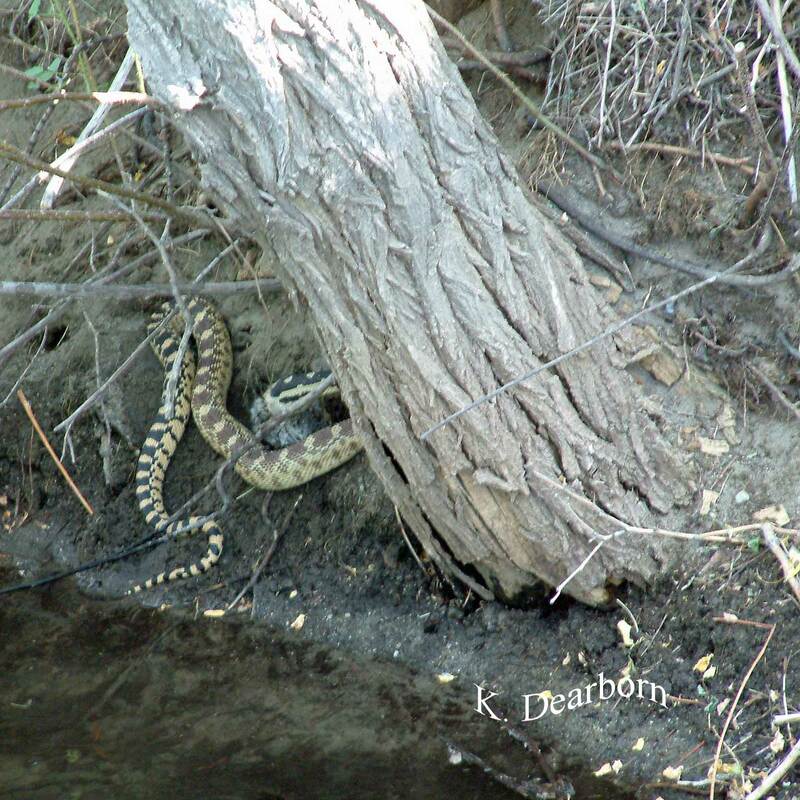 Note the pattern on the gopher snake, kind of checker-board black with yellowish. 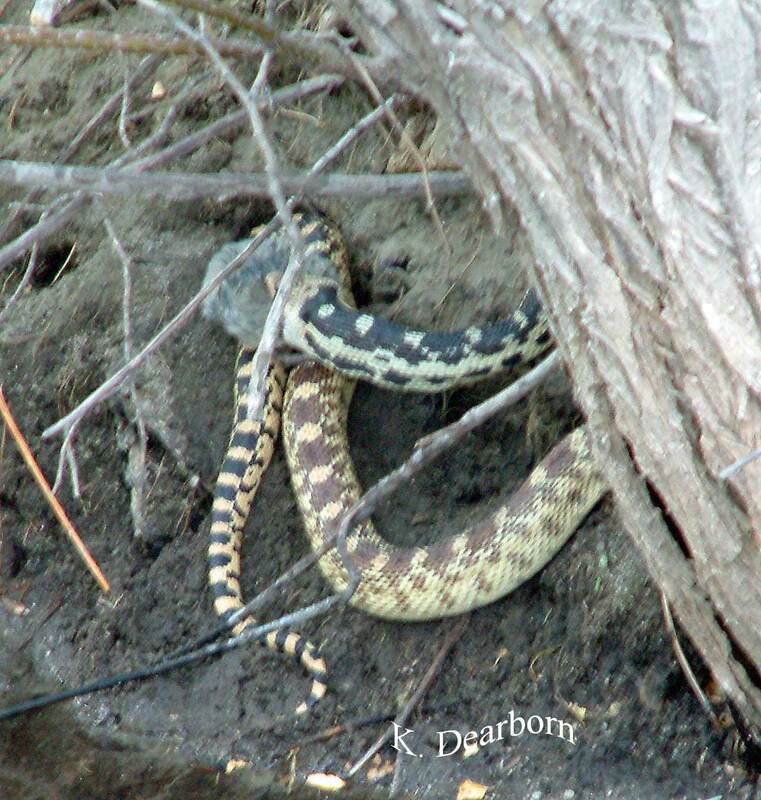 Frequently, gopher snakes are mistaken for rattlesnakes and killed without hesitation. These snakes are important rodent predators and not dangerous to humans. I am hoping that one day a gopher snake will one day take up residence in my yard. However, we do have a ring-necked snake that has moved in. But we have what gopher snakes are named after, more on that soon.